Grand prizes include a free knife and pass to the 2018 BLADE Show in our Best Carved Jack-o’-Lantern Contest. There will be two Best Carved Jack-o’-Lantern Contest categories: Reader Favorite and Editor’s Choice. Win your share of “ghoul’s gold” in Blademag.com’s first-ever Best Carved Jack-o’-Lantern Contest. Halloween will be here soon, so now’s the time to break out that pumpkin and get to carvin’! While you’re at it and to add to the fun, you might as well enter our contest for the chance to win a ghoul’s gold in free prizes. There will be two categories: Reader Favorite and Editor’s Choice. The grand prize winner in each category will receive a free knife and a free pass to the 2018 BLADE Show, the world’s largest knife show, June 1-3 at the Cobb Galleria Centre in Atlanta, Georgia. Three honorable mentions will win free tuition to the 5th Annual BLADE University, which is held the day before the 2018 BLADE Show begins and on show Friday and Saturday, also in the Cobb Galleria Centre. 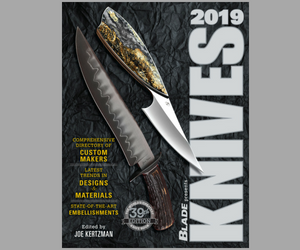 BLADE University is the most comprehensive array of educational classes on all things knife offered by any knife show. The rules are simple: Carve a pumpkin in a manner that you think will get the most votes from our voters. And feel free to get creative! Though many choose to make scary looking jack-o’-lanterns, you can carve a pumpkin in just about any design you like. Take pictures of your carved jack-o’-lantern and a picture of the knife you use to carve it, include the knife’s model name and brand, and email it all to us. Visit the site daily to view the entries and vote for your favorite. Meanwhile, tell your family and friends to go to our page and vote, too. Remember: One vote per person only please! We will announce the winner on Halloween, Tuesday, Oct. 31.